Enterprise Content Management - Document Retention Document retention is an important part of content management. SharePoint provides out-of-the-box support for managing document retention using the built-in expiration policy feature of the information management policy framework. The built-in expiration policy feature includes the ability to define expiration formulas based on document metadata, but there are many scenarios in which the expiration date depends on conditions external to a given document. In this session, we'll explore the information management policy architecture in detail and learn how to extend the expiration policy feature by writing custom document expiration formulas that calculate the expiration date based on data pulled from elsewhere in the SharePoint farm. 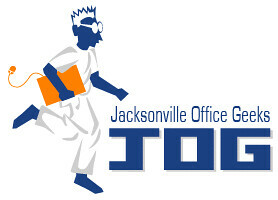 * Jacksonville Office Geeks is also known as the JAXDUG Office Developer SIG. SharePoint Framework v1.8.0 - What's in the latest Update of SPFx? Securing an Azure Function App with Azure AD - Works with SharePoint Framework!